Reading metal detecting books, and books about treasure hunting is a great way to become a better treasure hunter. The more information you have, the better chance you will have of locating more places to detect, perfecting your technique, and of course bringing home more finds. I have read many of the books found on this page. The best investment in the hobby that you can make is to build a personal library of books. Treasure hunting books, both old and new are in great demand, and especially the older, rare books. Knowledge is power. The more you read, the more knowledge you gain. And don’t just read books that pertain to this hobby either. Read history books. Especially read about the history of your area. If you do, I promise you that a whole new world of treasure hunting ideas will open up to you. The best way to find the history books about your area is to go to a local used book store. Browse through the local history section of the books they have. Most often you can buy them for a few dollars. That couple of dollars you spend is a great investment in your t'hing adventures. Another great place to find older history books of your area is at auctions and estate sales. You would be surprised at how inexpensive these books are. I've purchased boxes of old local history books for anywhere from $1 to $5. It's best to arrive at the sales early so you have some time to browse through the available items. That way you get an idea of what you want to bid on. Build a library of books on this hobby, history books, and metal detecting magazines. You never know when you will need to go back to a book for information you forgot about. It’s much easier to have your own research at hand than having to rely on your memory, or having to go back to the book store or to a library to get information you should have had at home. Take your time as you browse through the books below. There is a wealth of information from some wonderful authors. And, as I mentioned before, knowledge is power. The Successful Treasure Hunter Secret Manual Click Here! The Ultimate Treasure Hunters Guide Click Here! Shipwreck, Treasure and Scuba diving eBooks Click Here! Metal Detecting Secrets Click Here! 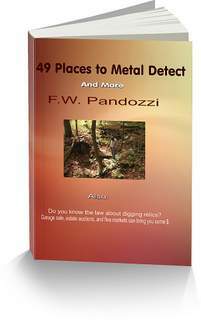 Metal detecting books are what started me on my path to treasure hunting.